Chief Deputy Byron Lyons spoke fervantly about leaders needing to have a hand in helping others. Abundant Light of Livingston Holds Inaugural Leading Light Awards, LIVINGSTON, July 22, 2008 - Abundant Light of Livingston, Inc, held its inaugural Leading Light Awards ceremony to recognize community leaders in Polk County and reward them for dedication and outstanding leadership to their community. 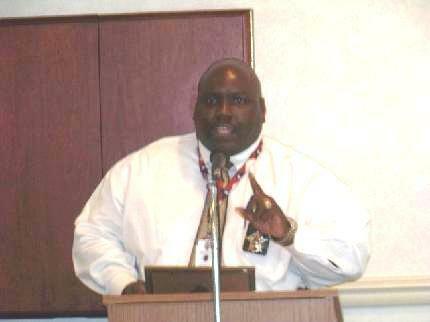 Company Founder, Mr. Kenneth Darden presided over the ceremony that played host to such community leaders as Livingston Police Chief Dennis Clifton, District Judge Elizabeth Coker, Livingston Mayor Clark Evans, First National Bank of Livingston President John Slocomb, Polk County Sheriff's Department Chief Deputy Byron Lyons and other community leaders and business owners. The keynote speech was delivered by Sandra Patterson, Director of Nursing at Angelina College. "I see only better things coming", Patterson said of Abundant Light of Livingston. Patterson said that she "...sees so much diversity here today and diversity is the spice of life". Patterson drove home the point that during our endeavors as leaders in our community that "...it's all about people and higher education and that is what we must keep in sight. Through teaching we touch lives". The event was held at Holiday Inn Express in Livingston. Door prizes were handed out and students who've graduated from Abundant Light and now have careers addressed the audience. Two of the former students were moved to tears as they addressed the audience and poured out thanks to Abundant Light, Pastor Darden, and the community. Following student speeches, awards were handed out to community leaders who one by one addressed the audience. Afterwards there were refreshments. Click on the images below for excerpts from speeches from some of our community leaders during Tuesday's Leading Light Awards ceremony.